Make the most of your day enjoying the sea, sun and relaxation. 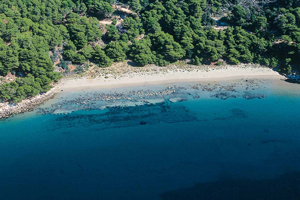 Visit the most beautiful beaches of the island of Mljet. The town of Saplunara is situated in a protected bay on the southeast part of the island of Mljet, its name comes from the Latin word sabalum meaning sand. We drive from the port of Pomena with a luxury minibus passing by the old island places, the lakes (Blatina) and the beautiful nature. Upon arrival in Saplunara choose one of the four sandy beaches of which the most famous are Velika and Mala Saplunara, enjoy relaxing in the sea and shade of centuries-old pine trees. Next to the beach there is a restaurant where you can refresh yourself with cold drinks and enjoy the fish or meat delicacies prepared by friendly staff. Only fifteen minutes walk on a macadam road from Saplunara, there is a real paradise on Earth, the bay Blace (locals call it Lemons). Its fascinating scene leaves visitors breathless. The beautiful sandy beach resembles a lagoon with a very narrow passage to the open sea and was the perfect scene for filming the Croatian reality show “Survivor”.